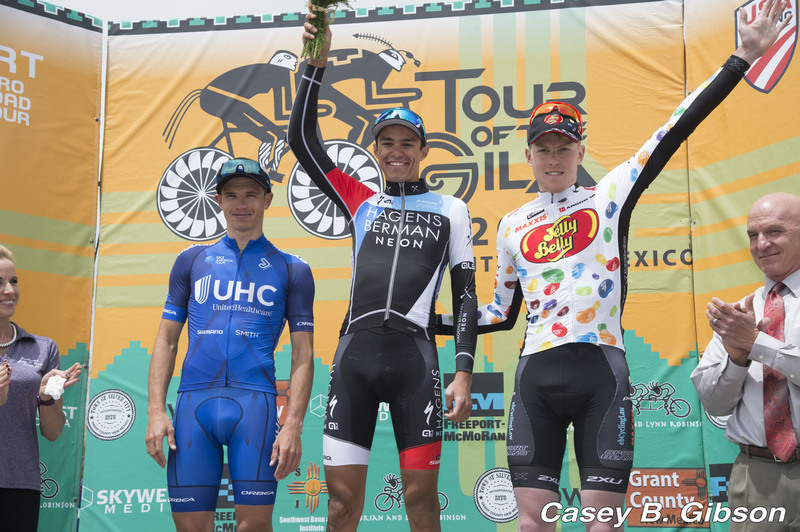 Christopher Blevins won his second road victory of the season on stage 2 at the The Tour of the Gila after sprinting past Daniel Jaramillo (United Healthcare Pro Cycling). After riding in a breakaway for most of the stage’s 76 mile (122.6 km) route, the Hagens Berman Axeon rider and four other riders managed just over a 4 minute advantage leading into the final KOM. 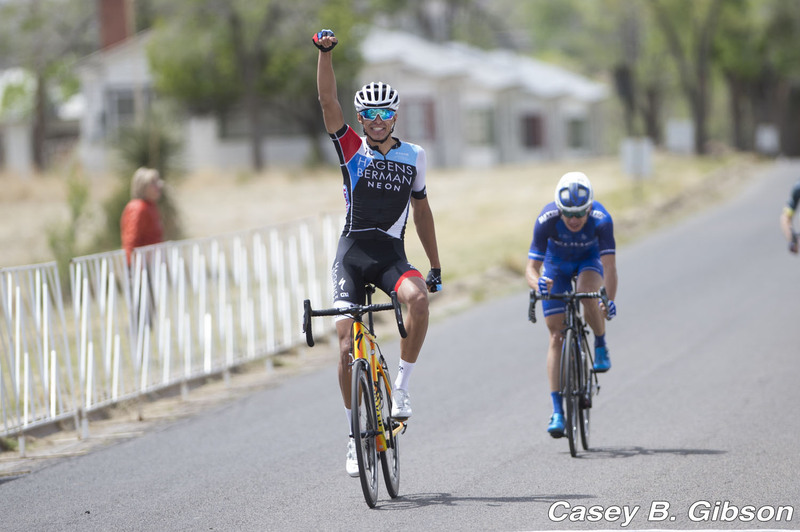 Leading into the finish, the 20-year-old from Durango, CO positioned himself second wheel with Janier Acevedo (United Healthcare Pro Cycling) who was riding for teammate Jaramillo. When Jaramillo made his move, Blevins reacted immediately, accelerating with Jaramillo, clawing back any distance Jaramillo was trying to put between himself and the break. Blevins’s response and own acceleration was significant and in the end proved too much for Jaramillo. Cormac Mcgeough (Jelly Belly p/b Maxxis) finished third. Top Canadians on the stage were: Rob Britton (Rally Cycling) 8th at 1:32 back, Pier Andre Cote and Alec Cowan (Silber Pro Cycling) 9th and 10th at the same time. Britton holds onto 2nd spot in the GC at 11s behind leader Sanchez. James Piccoli (Elevate-KHS) in 7th at 1:46, Nickolas Zukowsky (Silber Pro Cycling) 13th at 2:13 and Jack Burke (Jelly Belly p/b Maxxis) 17th at 2:32. 2 Daniel Alexander Jaramillo Diez (Col) UnitedHealthcare Pro Cycling at s.t. 4 Cullen Easter (USA) 303 Project s.t. 57 Michael Hernandez (USA) Aevolo all s.t. 59 Kip Taylor (USA) Team Rio Grande s.t. 62 Cristhian David Ravelo Avila (Col) 303 Project both s.t. 72 Travis Samuel (Can) Silber Pro Cycling all s.t. 78 Callum Gordon (NZl) Team California both s.t. 90 Brad Huff (USA) Rally Cycling all s.t. 92 Parker Kyzer (USA) Cyclus Sports s.t. 97 Thomas Wavrin (USA) Pacific Premier Bank all s.t. 111 Dennis Ramirez (USA) Gateway-Harley Davidson all s.t. 114 Jose Alfredo Santoyo Gonzalez (Mex) Canel's-Specialized s.t. 116 Joseph Garey (USA) Pacific Premier Bank s.t. 22 Jonathan Clarke (Aus) UnitedHealthcare Pro Cycling s.t. 25 Angus Lyons (Aus) Mobius Bridgelane s.t. 31 Efren Santos Moreno (Mex) Canel's-Specialized s.t. 57 Benjamin Wolfe (USA) Jelly Belly p/b Maxxis both s.t. 83 Oliver Flautt (USA) Cyclus Sports s.t. 99 Conor O'Brien (Can) H&R Block Pro s.t. 110 Rex Roberts (USA) Pacific Premier Bank s.t.